Porchetta is a beautiful and glorious thing. If you're not familiar, please check out my recipe. It's not completely traditional, but I think that it captures the true essence in a relatively easy fashion. 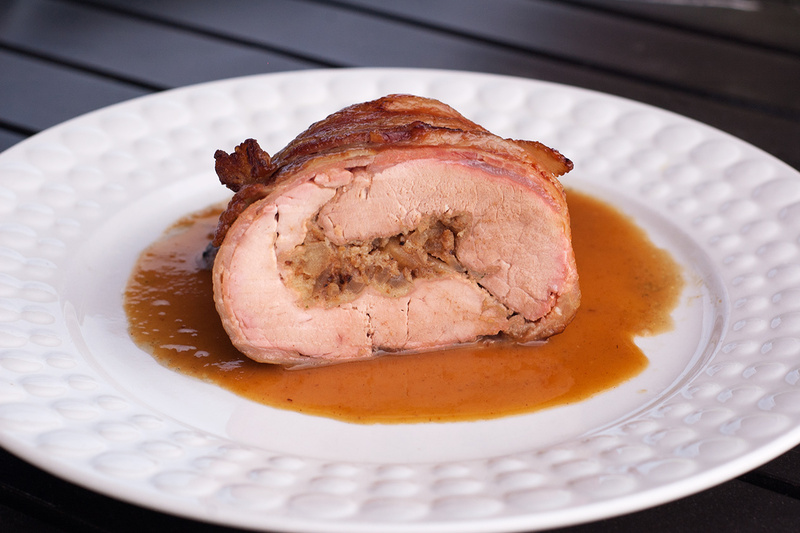 With this recipe I go a little further off-the-rails by using the basic porchetta style to explore new flavors. Unwrap the pork tenderloins. Make a 1-inch deep cut down the length of each being careful not to cut all the way through. Put the meat in a gallon-size zip-top bag and add 3 cups of the cider and 2 teaspoons salt. Seal the bag, squeezing out the excess air. Massage the bag to evenly distribute the brine and refrigerate 45 minutes. In a medium sauce pan melt 3 tablespoons of the butter then add the apple, onion, 1/4 teaspoon salt, 1/4 teaspoon pepper, cider and pumpkin pie spice to the pan. Bring to a slight boil then reduce to a simmer and cook until the mixture is the consistency of thick pie filling, about 15 minutes. Set aside and let cool to room temperature. After the tenderloins have brined 45 minutes remove them from the bag, drain well and pat each dry with paper towels. Start your grill and prepare for indirect cooking at medium heat (about 300º). 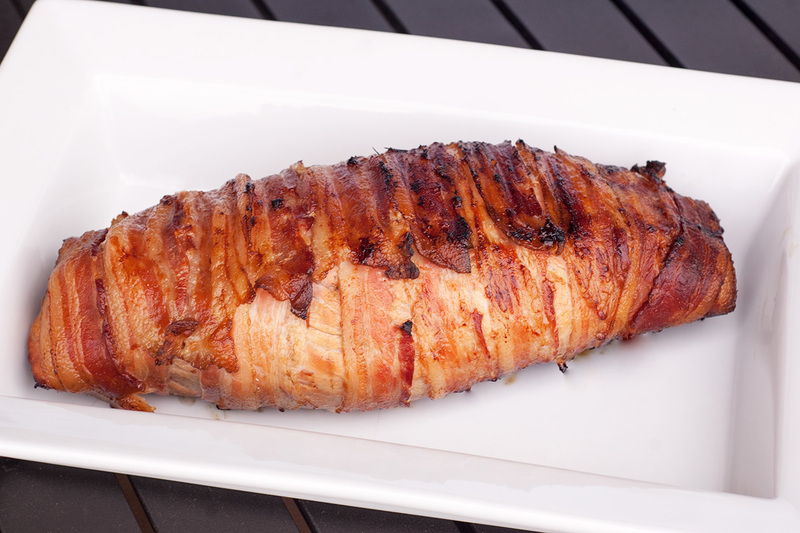 Prepare to wrap the tenderloins by laying the rashers of bacon side-by-side vertically on a rimmed baking sheet. Lie the tenderloins on top of the bacon and open them so that each lies flat with the cut side facing up. Arrange them so that the thick end of one adjacent to the thin end of the other. Dust the inside of each with the bread crumbs then spoon an equal amount of the stuffing mixture onto each tenderloin. Using the back of the spoon to spread it evenly across the surface of each. Turn one of the tenderloins over so that half of the stuffed side of one overlays half of the stuffed side of the other. 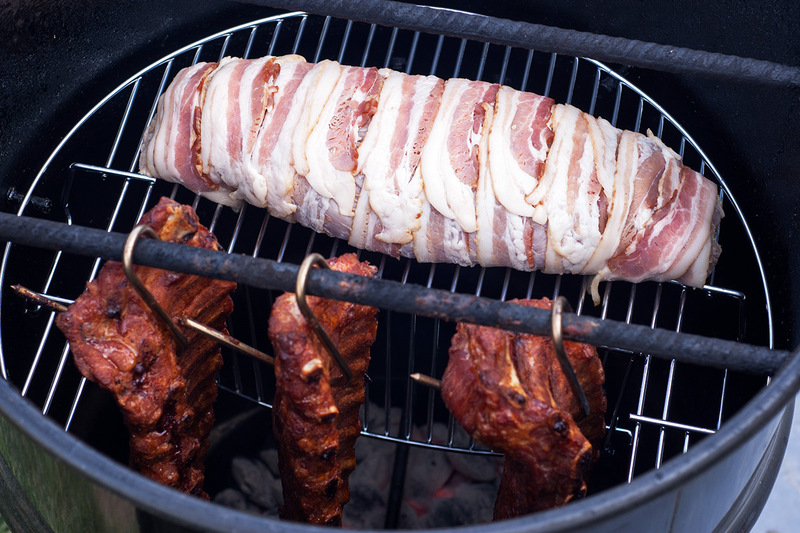 Gently roll the meat into a cylinder so that the two tenderloins are interlocked, then center it on top of the bacon. Starting in the center of the tenderloins, fold each end of a bacon slice over the top of the stuffed tenderloins, pulling each end gently. Working from the center outward, repeat the wrapping process with the remaining bacon slices. Carefully move the porchetta to your grill grate and cook indirect one hour, or until the internal temperature reaches 145º. I used my Pit Barrel Cooker with the optional hinged grill grate. While the porchetta is cooking, make the sauce. Combine 3 tablespoons butter, apple butter, the remaining cup of cider in a medium sauce pan, bring to a slight boil, reduce the heat to a simmer and let cook until reduced by half. When the porchetta has reached an internal temperature of 145º remove it from the grill on to a cutting board and let rest five minutes. 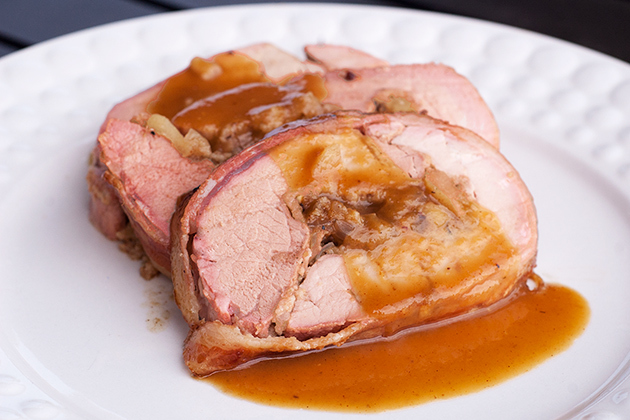 Cut the porchetta across the grain into 1/2" medallions, plate and spoon on some of the sauce. Went through your recipes and i really love it. Grandma is planning on getting a new grill, do you have any suggestions? Love to learn more from you, and please try to post often for your followers. Chris - Thanks for your kind comments. As for a grill, it really depends on what you want to do on it, but an outstanding all-around smoker/grill is the Pit Barrel Cooker. Some sauerkraut would be right at home with it as well. Thanks for your gracious comments. I hope that you enjoy it. This was delicious, shame I didn't discover this recipe earlier as I won't be doing so much grilling now it's getting colder. 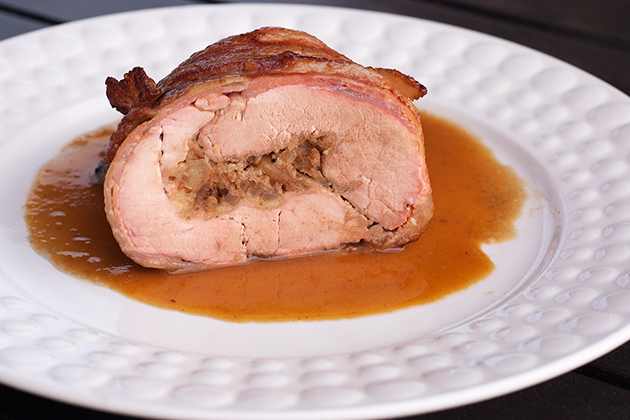 Great Porchetta recipe. Look forward to more recent blog posts! I like how you push the boundaries; after all, that's what cooking is all about! Wow. That is an absolutely beautiful piece of meat. Thank you for this recipe. I love pork tenderloin and have never made anything remotely like this. Will definitely be giving this a try. Thanks, Jason. If you do try it, please spin back by and tell me what you think.